Backyard decks offer many choices. Which ones are best for you? Decks are available in hundreds of style combinations. 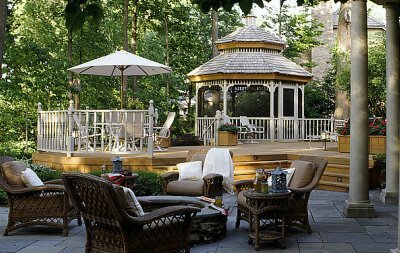 Backyard decks and patios are the basic building blocks of backyard design. Patiosare discussed separately. Many of the other options available for enhancing your outdoor living area are complementary to the overall design planning. Start with the right design and then add other elements over time, or immediately if your budget allows. Either way, choose wisely and the results will be just the way you envision them! After reading the overview below, check out our design tips page to help you plan the perfect deck for you. Some homes come with very little thought given to the outdoor areas , some with decks as small as 10' by 10'. If that's what you got with your house, we will discuss elsewhere how to maximize that space, and hopefully to enlarge it. Before you can determine the size you will need, you have to determine what you will be doing with the space. Will you use it for outdoor dining? You'll need a table and at least two chairs. If you only need one chair we need to find you a website to help with your social skills! The outdoor table and chairs take up room. A grill takes up even more space. If you have larger gatherings you'll obviously need more space. 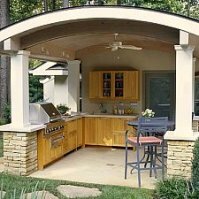 But you can combine all of your backyard design ideas to come up with a great overall backyard, one that will greatly enhance the fun and value of your home. There are a variety of materials available for outdoor building. Which one is right for you? What about the cost differences? How much maintenance is required? How often does a particular material require staining? Which type of deck railing is best? Railing is available in many styles made of many materials.Which one is best for your design? Do you even need railing? Which railing style will look best? Is a sunburstpatttern right for you? There are lots of choices here, and the differences are dramatic, so give this one careful consideration. Once you've made these and other decisions, you may want to add lighting to increase the safety and usability, as well as the beauty of your new outdoor living area. Solarlighting is easy to install and can make a dramatic impact. 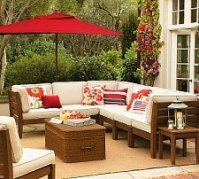 And of course, in order to use the area, you will need to choose some outdoor furniture as well. Once again, lots of important decisions! It important to plan out all these things before you start. Just like any other decision making process, you can only make the best decision when you have the best information. That's why we're here! We want you to be aware of the options, and to have accurate and useful information about each one. Armed with that knowledge, and a few tips and pointers, you can then make good decisions about the design of your project. One of the most critical decisions will be whom you choose to build your project. Make sure your contractor is experienced, insured, and competent. In the central North Carolina area, consider our friends at Camino Construction Services.I consider them the best outdoor builders in the area. But a deck is just a box made of wood with some boards nailed on top, right? That's about it, huh? No - the options and choices are only limited by your imagination. And, well, your budget! The architecture of your home should be taken into account when developing the design of your outdoor living area. Designs can incorporate gazebos or pergolas and should be developed to suit your needs. Now go to our page about design tipsand start planning your dream deck. 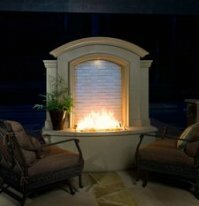 For more information about designs for wooden decks, visit my friends at specializeddecks.com. Got a Great Tip for a Deck Design? What's your best idea for a deck design? Have you tried something that worked well? Share your idea or your experience here with other readers! Your story will appear on a Web page exactly the way you enter it here. Share your ideas, your experiences, or your thoughts. Do you have some pictures or graphics to add? We'd love to see them! Here's howClick the button and find the first one on your computer. Select it and click on the button to choose it. Questions? Comments? Suggestions? Just want to say hello? We'd love to hear from you. Just use the form below and hit submit. You'll be taken to a submission page. Thanks!